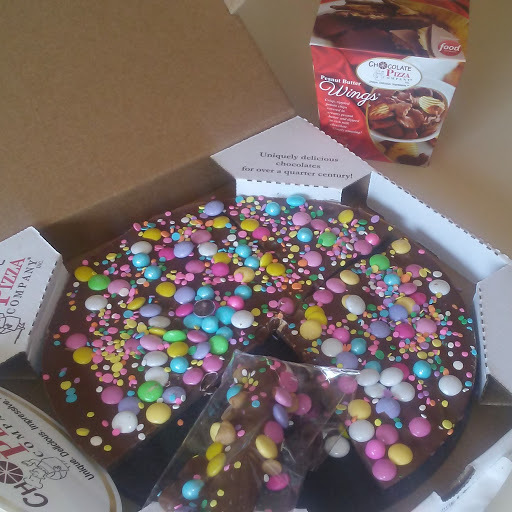 Chocolate Pizza Company Easter Gift Guide Tastiest Treats! Chocolate Pizza Company is sure to be a crowd pleaser this Easter! 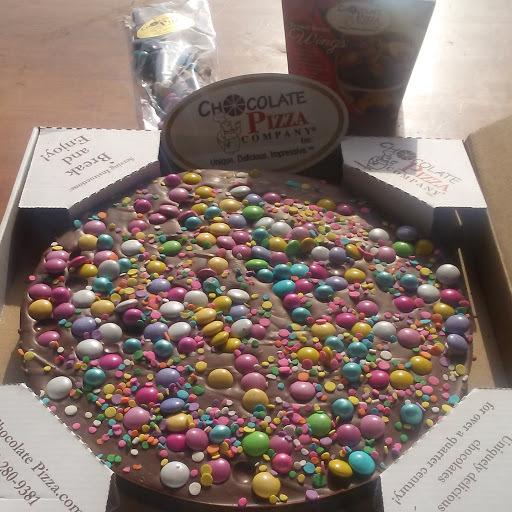 Their unique, one of a kind Chocolate Pizza and other candy confections are the perfect gift for Easter basket stuffers or for that perfect desert with Easter dinner. Chocolate Pizza Company is just one of those things you can't go wrong with! They have combined my two favorite things into one; pizza and chocolate. Chocolate Pizza Company makes truly delicious treats! We were able to try the Spring Chocolate Pizza, Peanut Butter Wings and Spring Peanut Butter Sparklers. The Spring Peanut Butter Sparklers are a specialty item. Chocolate Pizza Company isn't just great tasting they truly make works of food art in my opinion. The talent and creativity it would take to come up with these pizza varieties and the decoration that goes into items like the wedding favors is amazing to me. They have Chocolate Pizza's and specialty treats for every holiday or event you can imagine. I thought the little wedding dress and tux pretzels were so cute! I thought the Spring Chocolate Pizza was amazing. The Spring Chocolate Pizza is a layer of chocolate for the "crust" with homemade English toffee blended in. The homemade English toffee really brings a great taste to the chocolate. The chocolate itself is really tasty and you can tell is high quality chocolate but when you taste the homemade English toffee too; it brings your taste buds to a whole new level. 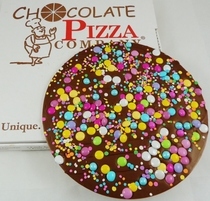 The Spring Chocolate Pizza is topped with different pastel colored chocolate candies like spring mix M and M's and is sprinkled with sugar confetti in pastel also. You can choose dark or milk chocolate and also choose to add a bow and message. If the Spring Chocolate Pizza isn't for you then build your own here. You can add any toppings you like! A Chocolate Pizza would be perfect to add as a desert on the desert table for Easter dinner. 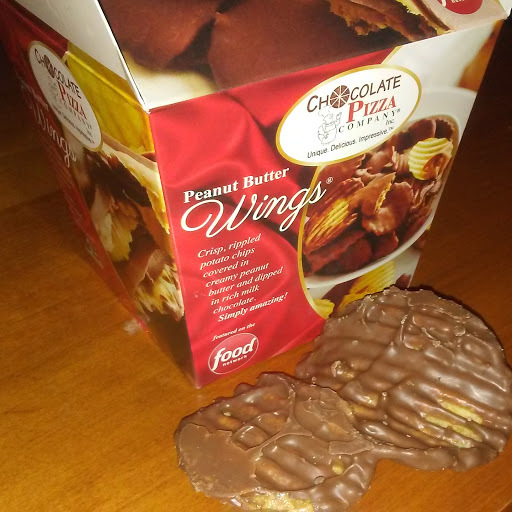 The Peanut Butter Wings really surprised me. I myself am not a fan of Peanut Butter but the combination of the chips, milk chocolate and peanut butter is great! The wings have a generous amount of peanut butter. The chips are the ridge variety and the peanut butter fits perfectly in the ridges and is topped with a generous amount of chocolate. These make the perfect snack! The Spring Peanut Butter Sparklers were truly a delightful treat. The bright colors make the snack very inviting. They would be the perfect decorative touch for an Easter basket and perfect children's treat. The pastel chocolates and sugar confetti used to decorate the treat make it visually appealing for kids and even tastier! Make sure to order a few of these for your child's basket!